Safe and accurate dental technology. A small sensor is placed in your mouth. The sensor is connected to a computer thru a USB cable. Next, an x-ray beam is sent towards the sensor, which records the image of your teeth and sends it to the computer. The sensor can then be repositioned to photograph other sections of your teeth. 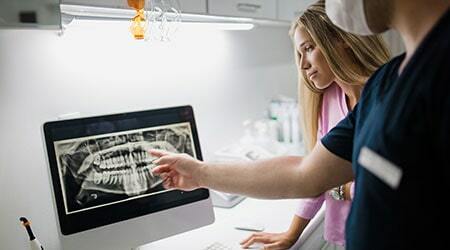 Digital x-rays are the safest and most effective ways of checking your oral health and bone health. Digital methods cut the radiation exposure by almost 90%, and the images are more advanced which help dentists to see everything that they need to. Plus, digital X-Rays are environmentally friendly and take less time than traditional x-rays. Very friendly staff, clean office, and modern equipment. Glad I came here and I'm happy I found a new dentist's office.